A pioneer in the sphere of Leadership and Executive Coaching in India, Krishna Kumar believes that a leader’s role is to bring about a positive transformation in society. While most of us dream of being in a better place, great leaders have got to where they are by applying the right form of leverage. Coaching provides them with that perfect lever. An active member of the international coaching community he was the Global President during 2016-17 and a Member on the Governing Board of the International Association of Coaching (IAC). He is a Founding Fellow of the Institute of Coaching (IOC), an affiliate of the Harvard Medical College. In a diverse and career spanning three decades, Krishna Kumar has donned various hats during which he has served as a corporate executive, a sports coach, an entrepreneur, a B-school professor, Independent Board member and a Leadership Coach. 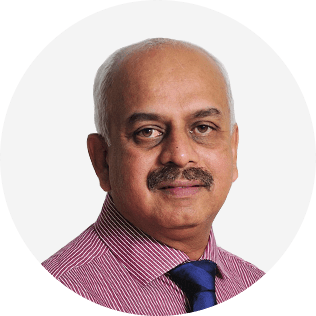 As a Leadership Coach, Krishna Kumar brings to the table his expertise in various fields gained over these past three decades. In 2016 he developed and presented in various global forums his AWARETM Coach methodology that incorporates concepts and practices from sports psychology and organizational behaviour to enhance performance of senior managers in the corporate world. The model has been successfully implemented in coaching various senior executives and CEOs from companies across India and overseas. As a Leadership and Strategy Advisor, Krishna Kumar has worked with business leaders in corporations across various sectors helping them with strategy formulation. He has been an executive coach to numerous global executives that included Indian, Asian, American, British, Canadian, French, German and Singaporean nationalities. His past and present clientele includes senior leaders in global firms like Oracle, CISCO, TESCO, Boeing, Infosys, Robert Bosch, Polo Ralph Lauren, Manhattan Associates, Legal & General (UK), Decathlon (France) and many others. His passion for sports, especially tennis, resulted in Kinesis Tennis Academy, an organization that is today rated amongst India’s premier professional tennis training institutes. A USPTR certified tennis coaching professional, he is also the recipient of the USPTR India President’s award for contribution to the field of tennis coaching and the PTR (United States Professional Tennis Registry) award for the Pro Coach of the year 2011. His students include one of India’s finest tennis players, Vishnu Vardhan, who represented India at the London Olympics in 2012. Krishna Kumar’s educational qualifications include a degree in Mechanical Engineering and an MBA from two of India’s Ivy League institutions, the Indian Institute of Technology and the Indian Institute of Management. He also has a general management certification from INSEAD. He is a Board Certified Coach (BCC) by The Centre for Credentialing & Education (USA) and a Cisco Certified Strengths Coach (Marcus Buckingham Strengths Coach). In addition, he is certified by Harrison Assessment and Pearson Talent lens in the use of their psychometric testing instruments and has extensively used Belbin, Instinctive Drives, HBDI, 360 deg, PDI, MBTI and many others in his coaching practice. Jointly with his wife, Nirmala, a certified Career Coach, Krishna Kumar founded Success Compass, a social initiative to help young adults discover the careers of their choice. In the past three years they have coached over 200 young people, which they consider to be amongst their most notable achievements. Krishna Kumar is frequently invited to deliver the keynote address at international events, that included the World Business & Executive Coaching Summit (WBECS) , Desafio Coaching Conference, ICF Taipei, IAC Kuala Lumpur and Budapest to name a few. Leadership in the twenty first century is less about dominating a market place or exercising authority over others. In a world ramped up by technology that moves businesses in non-linear paths, leaders are required to continually function at warp speed and deliver results. Coaches will need to further their learning of the existing frameworks, models, processes and competencies that were largely derived from an eclectic mix of subjects like positive psychology, philosophy, spirituality and so on. While these subjects provide tremendous insights, the future of coaching demands that we move beyond supporting the individual’s personal and professional growth and support the leader in creating an engaged and high performing workforce with a commitment to higher social responsibility and community consciousness. Great leaders bring about transformation by applying leverage, at the right place in the right manner and at the right time. Coaching can show leaders how to apply leverage and create an atmosphere of trust and self- belief that helps others to overcome the limitations that they have set for themselves, increase the emotional well-being of their communities and gets them to perform at their best. 2. Learn techniques for building self-awareness and self belief.